This week President Obama announced a far-reaching plan to require reduction in carbon dioxide emissions from power plants, mandate increased vehicle mileage, and authorize more subsidies for solar and wind power. He plans to make an end run around Congress on these issues by using executive orders. He said science has put to rest the debate over global warming, and he derisively likened those who disagree on this to a Flat Earth Society. But it is Obama and the other global warming alarmists who, like “flat earthers,” are in denial of reality. The doctrine of human-caused global warming, via carbon dioxide emissions, has already been thoroughly discredited by science. Denying the science or falsifying it cannot change the truth, but that is what has been done for political reasons. In presenting measurements of CO2 concentrations in the pre-industrial ice core from Byrd Antarctica, Neftel, et al., in 1982 showed maximum values of up to 500 ppmv. In 1988, the same authors published measurements for the same section of the Byrd ice core, but left off the high readings previously published, reporting a high of 290 ppmv, in agreement with the global warming theory. Until 1985, the published CO2 readings from air bubbles in pre-industrial ice ranged from 160 to about 700 ppmv, and occasionally even up to 2,450 ppmv. After 1985, the high readings disappeared from the publications! To fit such a wide range of results to the anthropogenic climatic warming theory, which was based on low pre-industrial CO2 levels, three methods were used: (1) rejection of high readings from sets of pre-industrial samples, based on the credo: “The lowest CO2 values represent the best CO2 concentrations in the originally trapped ice”, (2) rejection of low readings from 20th century samples; and (3) interpretation of the high readings from pre-industrial samples as representing the contemporary atmosphere rather than the pre-industrial one. Pearman, et al. “on examination of the data,” rejected 43 percent of the CO2 readings from Law Dome, Antarctica core, 39 percent of the CH4 [methane] readings, and 43 percent of the N2O [nitrous oxide] readings, because they were higher or lower than the assumed “correct”' values. Leuenberger and Siegenthaler claimed that their data from a Greenland ice core demonstrate that the present level of N2O in the atmosphere, 310 ppmv, is an effect of a recent 19 percent increase caused by industrial activity. To reach this conclusion, they rejected 27 percent of the samples with N2O readings deemed to be “too high” for pre-industrial ice. Etheridge et al. claimed that their ice core results show a pre-industrial N2O concentration of 285 ppbv. This value was calculated after rejection of 44 percent of their measurements! From the remaining analyses, the high readings from the 16th and 17th century ice, ...which were higher than 20th century samples,...were again eliminated without explanation. In the cold countries of Russia and Canada, the rural stations in the Polar Regions were thinned out leaving behind the lower latitude more urban stations. The data from the remaining cities were used to estimate the temperatures to the north. As a result the computed new averages were higher than the averages when the cold stations were part of the monthly/yearly assessment. In Canada, the number of stations dropped from 600 to less than 50. The percentage of stations in the lower elevations (below 300 feet) tripled and those at the higher elevations above 3,000 feet were reduced by half. [The] depicted warmth comes from interpolating from more southerly locations to fill northerly vacant grid boxes, even as a simple average of the available stations shows an apparent cooling. The IEA [Moscow-based Institute of Economic Analysis] believes the Russian meteorological station data did not substantiate the anthropogenic global-warming theory. Analysts say Russian meteorological stations cover most of the country's territory and that the Hadley Center had used data submitted by only 25 percent of such stations in its reports. The Russian station count dropped from 476 to 121 so over 40 percent of Russian territory was not included in global temperature calculations for some other reasons than the lack of meteorological stations and observations. Weather station Uchur has a long and almost continuous series of meteorological observations from 1940; the station Toko—an intermittent series of observations from 1946 and continuous only since 1957; however, the trend towards warming in the 20th Century was more pronounced according to station Toko. In the calculations of global temperature, HadCRUT predictably uses the data solely from the station Toko. Russia and Canada are not exceptions. The same thing was happening all over the globe. Throughout South America the higher elevation stations disappeared, while the number of coastal stations increased. In Europe higher mountain stations were dropped and thermometers were marched toward the Mediterranean, lower elevations, and more cities; the station dropout was almost 65 percent for Europe as a whole and 50 percent for the Nordic countries. Africa is not showing warming despite efforts to make it appear so by eliminating thermometers from cool areas like the Moroccan coast and moving them toward the Sahara. As recently as 1988, over 400 stations in China were utilized in the reporting network. In 1990, only 35. The raw temperature data show no trend in temperatures in Northern Australia in 125 years. The IPCC, however, uses “adjusted” data. NOAA makes data “adjustments” to remove “inhomogeneities” and for other reasons. The D'Aleo and Watts report says: “We have five different records covering Darwin from 1941 on. They all agree almost exactly. Why adjust them at all? NOAA added a huge, artificial, imaginary trend to the most recent half of the raw data.” The raw temperatures in Darwin were falling at 0.7 C. per century. After the NOAA adjustment, the temperatures were rising 1.2 C per century. In the United States, most of the remaining stations are at airports or at other locations unlikely to yield representative results, and most of the higher elevation stations in the West are gone. The only remaining stations in California are in San Francisco, Santa Maria, Los Angeles and San Diego. There are two weather organizations that provide satellite data and three that publish surface data. Those three are the National Oceanic and Atmospheric Administration (NOAA)'s National Climate Data Center (NCDC), NASA's Goddard Institute for Space Studies (GISS), and the University of East Anglia's Climate Research Unit—and all three depend on data supplied by ground stations via NOAA! The EPA statement in the Federal Register December 9, 2009, “Warming of the climate system is unequivocal” was followed by “The global surface temperature record relies on three major global temperature data sets, developed by NOAA, NASA, and the United Kingdom's Hadley Center. All three show an unambiguous warming trend over the last 100 years.” The EPA intent obviously was to try to downplay the effect of any Hadley/CRU data manipulations (after the “climategate” scandal of damaging emails was disclosed) by showing the end result was validated by the other two agencies. But since the three agencies all depend on the same NOAA data, their unambiguous agreement demonstrates not validity but their common corruption. For seventeen years now there has been no global warming—even from the current reduced network of reporting stations—but carbon dioxide emissions have continued to soar. This certainly casts doubt on the assertions that higher levels of CO2 cause global warming. At the same time, the evidence has become overwhelming that changes in the earth's temperature are determined by the sun, making the dogma that CO2 causes global warming as obsolete as arguments that the earth is flat. 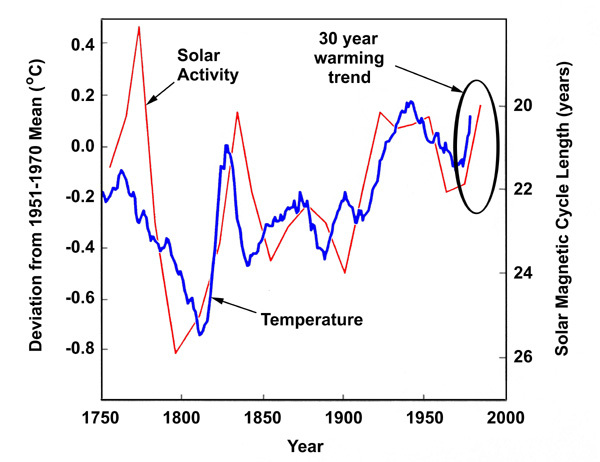 Figure 3 shows the close correlation between the earth's temperature and the sun's magnetic cycle, which is a proxy for its variations in brightness (irradiance). The shorter the magnetic cycle length, the more active, and hence brighter, the sun. Cosmic rays have an even even stronger correlation than irradiance, but I do not have a graph to show this. While orbital changes produce long-term climate cycles by varying the distance of the earth from the sun, shorter term cycles are determined by changes in the surface of the sun itself. The sun's radiation is varied by disturbances on the surface of the sun, called “sunspot cycles.” Magnetic fields rip through the sun's surface, producing holes in the sun's corona, solar flares, coronal mass ejections, and changes in the “solar wind,” the stream of charged particles emanating from the sun. The solar wind, by modulating the galactic cosmic rays which reach the earth, determines both the formation of clouds and the carbon dioxide level in the earth's atmosphere. Sunspot cycles cause only slight changes in the sun's radiation, but these changes are amplified many fold by interaction 1) with ozone in the upper stratosphere, and 2) with clouds in the lower troposphere. Clouds have a hundred times greater impact on climate and temperature than CO2. Perhaps we should not be surprised that the global warming alarmists still cling to their CO2/global warming dogma in the face of the contrary evidence: 17 years of no global warming despite a soaring increase in CO2 emissions. There was ample evidence before this that their dogma is incorrect, but they ignored it. For example, all of the computer modeling of global warming assumes—for sound theoretical reasons—that warming from a greenhouse effect must be 2-3 times greater in the lower atmosphere than at the earth's surface. This is not happening. Both satellites and weather balloons show slightly greater warming at the surface. These atmospheric temperature measurements furnish direct, unequivocal evidence that whatever warming has occurred is not due to the greenhouse effect. Still, the greenhouse proponents cling to their dogma. According to the greenhouse hypothesis, the warming should occur equally during day and night. But most of the warming that has been observed has occurred at night, thus falsifying the models. The greenhouse believers are undisturbed by this. Since carbon dioxide is a very weak greenhouse gas, computer models predicting environmental catastrophe depend on the small amount of warming from carbon dioxide being amplified by increased evaporation of water. But in the many documented periods of higher carbon dioxide, even during much warmer climate periods, that never happened. During the time of the dinosaurs, the carbon dioxide levels were 300 to 500% greater than today. Five hundred million years ago, the level of carbon dioxide in the atmosphere was 15 to 20 times what it is today. Yet the catastrophic water-vapor amplification of carbon dioxide warming never occurred. Today we're told catastrophic warming will result if carbon dioxide doubles. But during the Ordovician Period, the carbon dioxide level was 12 times what it is today, and the earth was in an Ice Age. That's exactly opposite to the “runaway” warming that computer models predict should occur. Clearly the models are wrong; they depend upon an assumption of amplification that is contrary to the climate record of millions of years. Still, the greenhouse proponents cling to their dogma. The facts don't matter. Hidden in the scare-tactic claims of "runaway" global warming from increasing CO2 is the fact that its effect is logarithmic. That means each increase produces less effect than the previous one. David M. Hoffer offers this very useful explanation: “Consider that you have several pairs of sunglasses, each of which block 50% of the light. If you put two pairs in a row, do they block 100%? Of course not. The first pair blocks 50% and the second pair blocks 50% of what is left, which is 25% of the original light. The third pair would block only 12.5% of the original light. CO2 suffers from the same law of diminishing returns.” But the True Believers still warn of a coming danger of runaway global warming from increasing CO2. Why is it that the global warming advocates are unfazed by any contrary evidence, no matter how strong? All their claims of disasters and “tipping points” have been debunked. All their computer models have been shown to be false, to be based on flawed assumptions, incapable of being reconciled with observable facts. Vaclav Klaus, former president of the Czech Republic and a university professor before he became president, is the author of a book on global warming and has spoken often on the subject. He says, “What frustrates me is the feeling that everything has already been said and published, that all rational argument has been used, yet it does not help.” It does not help because global warming alarmism is not based on rational argument. It is not based on science. It is not based on reality. It is based on political ideology. If rational argument doesn't fit, then phony arguments must be invented: the spread of malaria, the loss of biological diversity, polar bears disappearing, etc. If computer models can predict disaster scenarios only by programming unrealistic assumptions, then that will be done. If global warming does not fit the observable temperature measurements, then a new “reality” must be invented to fit the ideology: the actual temperature records must be altered or excised. Ditto for carbon dioxide measurements. The global warming advocates are not disturbed by all this because, in their view, ideology trumps reality! “I think if we don't overthrow capitalism, we don't have a chance of saving the world ecologically,” said Judi Bari, principal organizer of Earth First! The followers of the environmentalist ideology, however, keep presenting us with various catastrophic scenarios with the intention of persuading us to implement their ideas. That is not only unfair but also extremely dangerous. Even more dangerous, in my view, is the quasi-scientific guise that their oft-refuted forecasts have taken on....Their recommendations would take us back to an era of statism and restricted freedom....The ideology will be different. Its essence will, nevertheless, be identical—the attractive, pathetic, at first sight noble idea that transcends the individual in the name of the common good, and the enormous self-confidence on the side of the proponents about their right to sacrifice the man and his freedom in order to make this idea reality.... We have to restart the discussion about the very nature of government and about the relationship between the individual and society....It is not about climatology. It is about freedom.